For my blog’s one year anniversary, I wanted to do something “special.” Instead, I have written this short story. Thank you for following my rambles!!! *My blog’s one year anniversary was actually on Sunday, but March has not been my friend, so this post is a bit belated. Rumor has it that Juli’s mind is made of Swiss cheese. There is a strong possibility that not all of the details in this story are completely accurate. In all likelihood, some events were totally made up. Please be advised and thank you! 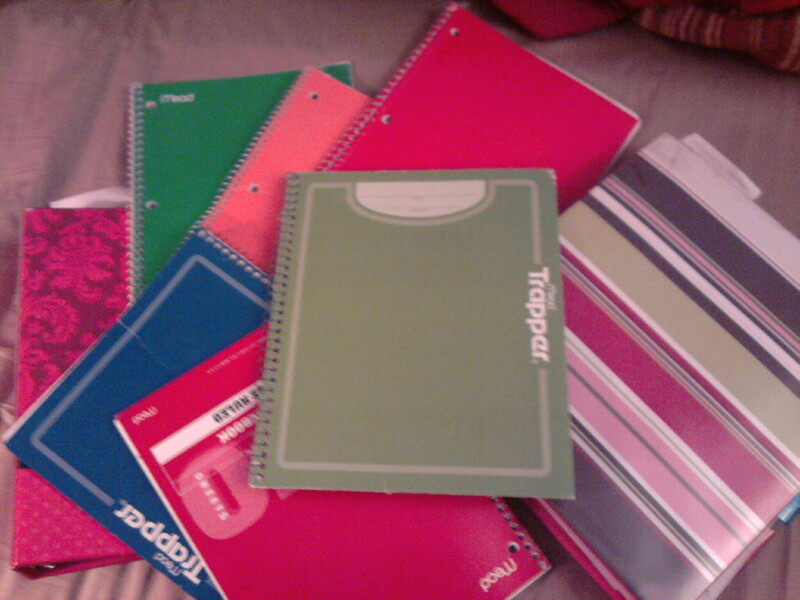 A small sample of the many notebooks that I've filled with my dribbles. There are MANY more, but I was too lazy to drag them out to take this picture. Once upon a time, there was a woman. Let’s call her Juli. Now, Juli was the type of woman who worked, and worked, and worked, like a little mule, but didn’t have many creative outlets for herself. Sure, she enjoyed gluing things together. Who doesn’t? She did a sewing project once in a while, but that was often more work than fun. She liked to grow things in her garden, though her plants had little chance of survival. Plants like to be watered regularly. Go figure! In general, if it took more than a day or two to complete a project, it had little or no hope of ever being finished. Juli enjoyed instant gratification. Unfortunately, Juli never put much stock in her own creative flair, but she had formed friendships with people who were intelligent, wise, and talented. Her friends were a patient motley crew who happily taught her what they knew about crafting, art, gardening, and life in general. Because Juli lacked confidence in her own potential, she was willing to learn just about anything that anyone would teach her. Her love of learning made her a good pupil, despite her natural-born stubbornness. Juli allowed her friends to fill her brain with a myriad amount of useful (and sometimes useless) information. It turned out that Juli didn’t know squat about a LOT of things. One day, Juli’s friend, Karole, came to Juli and asked her to look over a story she was writing. Karole was a journalism major. Juli read through pages and pages of carefully worded text and said, “I like it.” Juli, in her ignorance, thought this was helpful information to share with her good friend. This might be a good time to mention that Karole was actually a Saint, but liked to wear oversized Eastern Michigan t-shirts in order to hide her “real” identity, and to keep people from kneeling before her and lighting candles at her feet, which she does DESERVE. So far, her humble disguise has worked out beautifully. Go Karole!!! Anyway, Juli thought about the story that Karole had written, the words that she poured out from the depths of her soul. Karole waited patiently for a response and Juli answered, “Uhhh…hmmm.” Her jaw hung open, catching flies. This might be a good time to reiterate the part about Juli not knowing squat about a LOT of things, writing being one of them. Yes. This was a sad day for writers everywhere. Even though Juli was an avid reader, she read almost everyday, she paid NO attention to the words that she read. She might have liked or disliked a story, but she didn’t put much thought behind her reasoning. She didn’t think about the author, or the time and effort that went into the books she gobbled up like Halloween candy. Karole kindly explained to Juli what sort of feedback she was looking for. Juli nodded her head, as if she understood, but responded with, “???? ?” Her mouth gaped open once again. Lucky for Karole, Juli’s mind was all squishy goo and could easily be molded. Over the next few months, and years, Karole taught Juli about writing and poetry. Juli enjoyed the pleasure of reading lots and lots of beautifully written words. Did I forget to mention that little birds help Karole get ready each morning? No? OK, so I might have made that part up, but she REALLY is a cool person, and Beta readers are REALLY hard to find! Really! Really! Sometimes, you have to shape one out of the primordial muck, train them, housebreak them, and throw them a treat once in a while. It’s a process. As time went on, something peculiar began to happen. Juli started to pay attention to the stack of books that she read. Her brain was infected with foreign sounding terms like plot development and back-story. One day, another one of Juli’s friends came along and suggested that Juli NEEDED to read this “great” book. This particular friend, who shall remain nameless for her own protection, enjoyed paranormal stories, especially ones with vampires in them. Juli had never heard of the suggested book before, but this was also in the days before either fire or the wheel had been invented. Juli thought the cover was interesting. She did like apples, so she thought that she’d give it a try. Juli came to her mentor, Karole, and had herself a good rant. Karole said nothing at first, but wore a smile that was probably too evil for any “proper” Saint to wear. Juli stared at her friend in disbelief. Hadn’t she listened to the ranting? “Not everyone will like every book,” Karole continued. She then went on to explain how there’s ALWAYS something that can be learned, even in books we don’t like. These stories had obviously made a strong impression on Juli, and as far as Karole was concerned, that was a good thing. She asked Juli questions about the books, made Juli THINK. Juli didn’t like where this was going, though she was still blind to the path Karole had led her on. Juli went home and ranted about this to her husband, because he was a good hubby, and generally sided with her, plus it was easier to agree. Agreeing made the ranting end sooner. He also was an avid reader, and a man. The man part was important, because unlike Juli, who liked to ruminate on the insignificant details of life, Juli’s hubby was a problem solver. “I don’t know,” Juli’s hubby mumbled, as he attempted to leave the room, no doubt out of self-preservation, and said, “It was just a thought,” before dropping the subject. Whether or not Juli’s hubby realized what he’d done and what he’d gotten their family into, remains to be seen. Karole had already laid the foundation, and before that, Juli’s own mother, God bless her, had encouraged Juli to write when she was a kid. But truthfully, Juli NEVER dreamed of becoming a writer. She hadn’t written anything creative at all after the 5th grade. Juli’s childhood dream was to own a horse, and she made that dream a reality as an adult. Writing wasn’t HER dream! Writing was Karole’s dream! How had this happened? Juli wrestled with the idea of writing for a long time, a very long time. She was reluctant to face the reality that she could do something different with her life. With each book she read, the idea of writing her own story became more firmly rooted. But what story would she write? Juli didn’t know. Juli had NO idea how to even get started until she came across an unused journal she found in a box, while looking for something else. Her stepmother had given it to her after Juli’s biological mother had passed away. Juli had never written in it, because she didn’t consider herself a “journaling type” of person. She felt as though it were a “sign,” because she found the journal when she did, and began to write in it. A bunch of random ideas, too much encouragement, vats of coffee, and dozens of notebooks and zip drives later, Juli slowly became a writer. *You can find samples of Karole’s poetry on her blog, http://karolejl.wordpress.com/. 😉 Also, please do NOT blame Karole for this short story. I’d blame the cat. She hasn’t been doing nearly as good of a job as she could with the editing. Oh! I’d blame the dog, too. His life-coaching skills have left a lot to be desired. Popping in quickly to say happy blogiversary! Awwww…You’re such a sweetie! Thank you!!! “Karole said nothing at first, but wore a smile that was probably too evil for any “proper” Saint to wear. ” That is because I am no saint lol. Thanks for making me smile and feel good. Love you. You are an amazing woman! I must throw blame…err…credit, where credit is due! Love ya, Sweetie!!! Congrats on becoming a WRITER! 🙂 I loved the story, by the way. Ha ha! This was fun! I always think stories like this are far more interesting than “I wrote since I was a child… blah blah”. Speaking of writing…I FINALLY got around to hunting down your story, Wednesday’s Child. I’ve seen it mentioned before, but you’ve got so much out there, I forgot about it/didn’t know where to look. Anyways, I found it on myspace and I’m on chapter 15. Oh boy! I can’t believe you were only 17 when you wrote this!!! Dark stuff! I envy your ability to write such a dark story, even at a young age. I’ve tried to write some dark stories, just for myself, but they all come out humorous. I’ve given up fighting it! You write about murder, I’ve got shivers and disturbing nightmares. There’s bullets, and blood, and spines..oh my! I write about murder, and somehow it turns into a comedy about hiding the body and not tracking Ben’s pieces all over the new carpeting! Don’t ask! Gesh!! !